This rockabilly style personalised artwork would make a great wedding gift or keepsake. Featuring an old school tattoo inspired swallows and roses design with a vintage style sepia background. The wording can be personalised with the couple’s surname and wedding date, please send me a message or leave a note at the checkout. The artwork is supplied in a cream coloured mount ready to be framed. Measures approx 8×10 inches. Create your own DIY table plan/ seating chart and show your guests where they are sitting. You can hang them up with pegs, or stick them onto a board, put them into a frame etc. 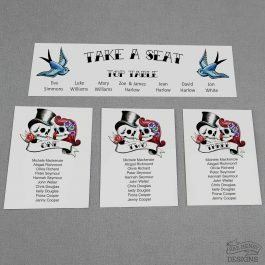 The cards have a tattoo style skull Bride & Groom and blue swallows design printed onto 240gsm white card, single sided. They will be printed with your guests names, please send a list of the guests for each table as a note at the checkout, message or email. Please choose the amount of tables from the drop down box. Top Table card also available- please select from the drop down box. Exact shade of colour may vary slightly from the pictures on screen. Complete the look with table numbers, place cards and more matching wedding decorations available. 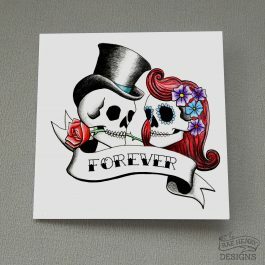 Featuring a tattoo style skeleton Bride and Groom with red coloured hair. Perfect for an Anniversary, Wedding or Valentine's day card. The greeting on the front reads “Forever” and the inside is left blank for your message. The card measures approx 6×6 inches square and comes in a clear protective bag with a white envelope. Also available with different hair colours, to suit any creepy couple!